(14503, Mike Williams Collection, OHS). As with so many Oklahoma towns, Davis owes its existence to the Atchison, Topeka and Santa Fe Railway. Although trains still clatter along the rails, more traffic flows down U.S. Interstate 35, situated two miles west of Davis, along State Highway 7, Davis's Main Street, and U.S. Highway 77, which runs north-south through town. Davis is located in Murray County, twenty-three miles north of Ardmore and twenty-three miles south of Pauls Valley. It has a council-manager form of government. Davis is named for Samuel H. Davis, who moved to Washita in the Chickasaw Nation, Indian Territory, in 1887. After relocating his dry goods store four miles south to the present town's site in 1890, he successfully petitioned for a Santa Fe depot to be constructed near his establishment. In March 1890 he obtained a post office for the settlement. It was initially proposed to be named Chigley, after Nelson Chigley, a Chickasaw on whose land the townsite was located. However, "Chigley" was already an Indian Territory town designation. Samuel Davis's post office petition of December 11, 1889, noted that his "place is very well known as Davis Store." The town became Davis and was incorporated on November 16, 1898. In 1900 Davis bustled with some fifty-seven business, two banks, ten doctors, three dentists, and three lawyers. Of its 1,346 residents, those who were not employed in retail sales were farmers, for Davis was at the heart of one of the best cotton-producing sections in Oklahoma. Davis's growth has been steady, with the census recording population numbers of 1,705 in 1930, 2,203 in 1960, and 2,782 in 1980. By 2000 the town's population had reached 2,610. Most residents were then employed in sales, production, or services. About one-fourth worked in the educational, health, and social service fields. Only sixteen listed farming, fishing, or forestry as their occupation. The 2010 census counted 2,683 in Davis. Davis is the home of Turner Falls Park, which the citizens voted to purchase for $21,000 in 1925. Located in the Arbuckle Mountains, Turner Falls is named for pioneer resident Mazeppa Turner, who represented Murray County in the Oklahoma Legislature from 1907 until 1911. Oklahoma's Initial Point, from which all of Oklahoma except the Panhandle was surveyed, and Fort Arbuckle are about eight miles west of Davis. 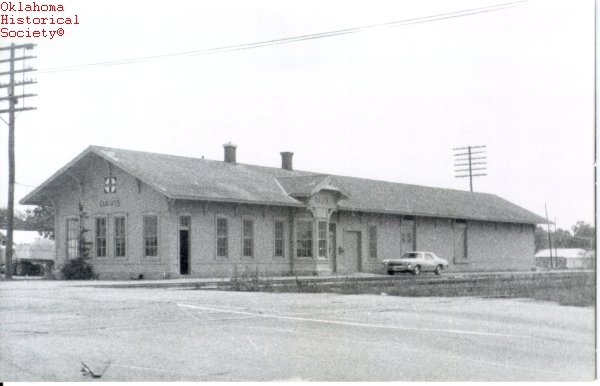 The Initial Point (NR 70000533) and the Davis Santa Fe Depot (NR 94001507) are listed in the National Register of Historic Places. Opal Hartsell Brown, Murray County, Oklahoma: The Heart of Eden (Wichita Falls, Tex. : Nortex Press, 1977). "Davis," Vertical File, Research Division, Oklahoma Historical Society, Oklahoma City. Theresa Gabel, ed., Davis, Oklahoma (Davis, Okla.: Arbuckle Historical Society, 1981). R. W. Chadwick and Sharon Chadwick, "Davis," The Encyclopedia of Oklahoma History and Culture, https://www.okhistory.org/publications/enc/entry.php?entry=DA015.